In case you missed this: now we have new magic number 5000. If you have less than 5k games you will be playing only with players that also have less than 5k games. If you have played more then you will always be playing against more experienced players. Check team stats if you don’t believe this and have fun! 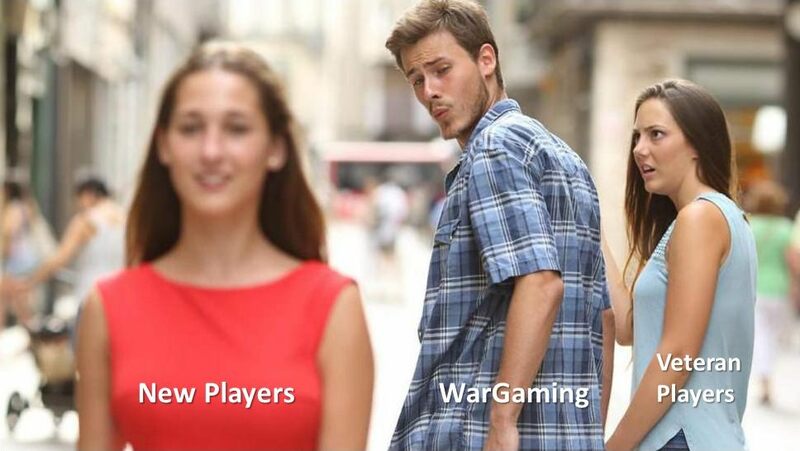 Sadly though I just can’t play poorly balanced tanks anymore because all balance is broken now and games are horrible. I may be playing against more "experienced" players, but I haven't noticed much of a change in terms of skill. In fact, I've noticed a marked decrease lately. Seal clubbing in tier 6 is much easier, and I'm seeing increased damage in tier X. Experienced does not mean good—there are quite a few players that have over 20k battles and win only third. My personal experience is that there are more steamrolls than ever. Losing one tank and having Wipeout isn't any fun, but I do believe inexperience plays some roll. I typically not always will try to play more conservatively when a tank down, trying to reel in the balance. And may not leave a strong spot as quickly. Of course that's when I'm not yoloing! I have seen so many steam rolls lately that when I get a truly well fought match I feel good even in a loss. So many blowouts win or lose makes me wonder what is really going on. I’ve reviewed the win rates of the players after a blowout and the don’t always follow the team with better win rate players winning the game. I liked things a lot better when only one in five games were blowouts. Now it seems like at least three in four end in a blowout. I don’t think this is true at all. I played a few games yesterday and saw tons of players with less than 1000 battles. I had one tier 7-8 game last night where everyone but me had less than 5,000 battles. I am becoming annoyed with consistently being placed low-tier. It's never bothered me in the past, but it's never been this consistent. Last night I was low tier 11 of 12 games, and I've been watching and seeing this same issue over and over again. It happens even when the queues show ample numbers of tanks in my tier and below. I have the same issue, but it seems like it's certain tanks. For me, specifically, it's the Tiger (P). I feel like I'm low tier 8 or 9 times out of 10. Luckily the tank is a beast that performs well in tier 8, but it's not dominant like it is in tier 7. And it's my current favorite tank. It just gets me. Whatever they've done, it's giving me fits. I have more trouble winning lately than ever - even in tanks I usually can carry a match in. I know - "git gud," "carry harder," yada, yada, yada, but some buckets of [edited] just cannot be carried. This is unrelated, but this morning, near the end of a match, I move in to attack some lights and mediums (I was in a TD for a mission, so of course I was bottom tier), and I got blown to bits by a T49. Not a happy camper... I was doing well in the damage ratio department until that moment. Is that thing op, or did I just get unlucky? Let's see what we have in update 5.4 news. Edited by TonnerreCadien, 15 October 2018 - 02:08 PM. The problem though is I still struggle to tell if it's a good thing or bad. In theory it should be a good change but in practice it causes more steamrolls because more experienced players understand limitations of their tanks and because maps are small and the number of tanks is limited I more often feel that I just can't do anything in this particular battle. Before people were doing more mistakes and I had more opportunities but now the game feels suddenly smaller and more limited. Honestly, I'm slowly shifting to WOWS PC version because it's much more interesting tactically. Blitz version of WOWS is total #$ because it's even more limited--totally unrelated to PC version and it feels more like pacman. Mobile tanks were good but these steamrolls and these new situations where I'm stuck in bad tank in bad position are killing me. Less seal clubbing is a good thing. There are a lot of issues with the current MM. For one, I am tired of the enforcement of platoons always facing a platoon on red. It makes waiting in the queue for a battle way too long. I see it more as a penalty that is completely unnecessary. Platooning is open to everyone, so all have the same advantage. I think if a platoon is in a queue longer than one and a half or two minutes should just be placed in a battle regardless as to whether or not a platoon is on red. No it's a good thing. Platoons are normally an advantage. This is an mm improvement. How so? Everyone can platoon. Also, not saying this should not be the case, but after sitting in the queue for over 2 minutes is ridiculous. Edited by ABN_Bearcat, 15 October 2018 - 02:49 PM. It's an advantage to one team to have a platoon when the other does not. Two minutes is very long. Much longer than what I get now.